Description: MESHWORKS BERLIN builds upon previous workshops investigating complex mesh topologies and fabrication assemblies. 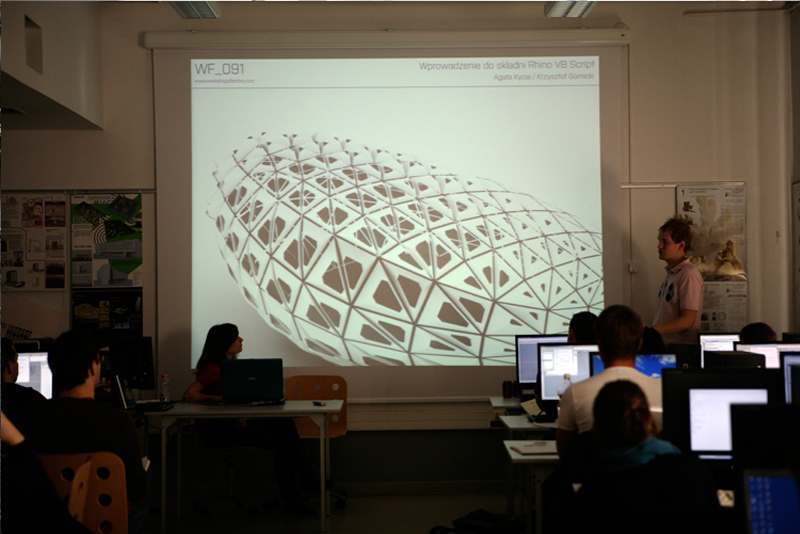 The five day event was tailored for the Fab Lab Berlin community of design and fabrication enthusiasts and provided quick paced introduction to Rhino/Grasshopper with its particular plug-ins Kangaroo, Ivy and Weaverbird, full workflow of parametric design and simulation as well as fabrication planning and execution of a full-scale spatial installation. 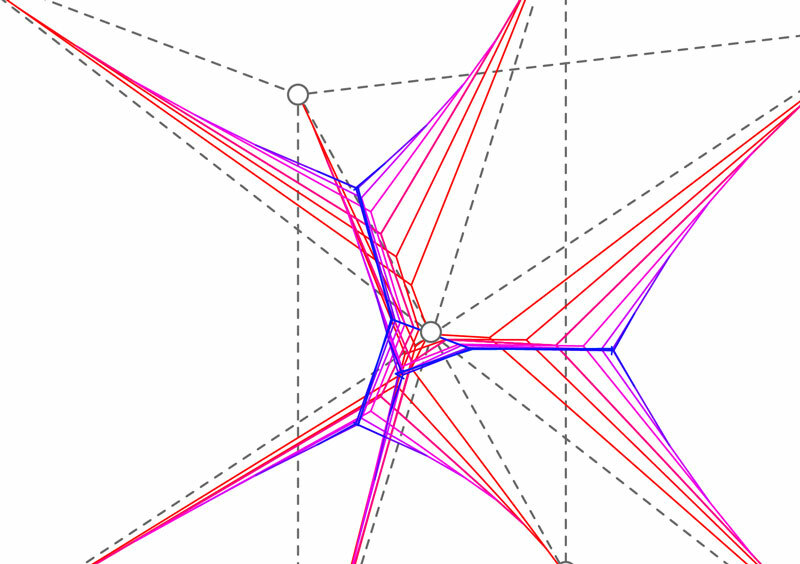 Hereby, the particular focus was put on force-based form-finding design of a convoluted geometry, which could be assembled of lasercut components from 20 m² black POM sheets (0.8 mm), pop rivets as well as steel cables and clip connectors. Consequently, the workshop was structured in two consecutive weekend blocks, with a separation into (1) computational design accompanied by lectures, technical training sessions as well as material testing and (2) fabrication and assembly. 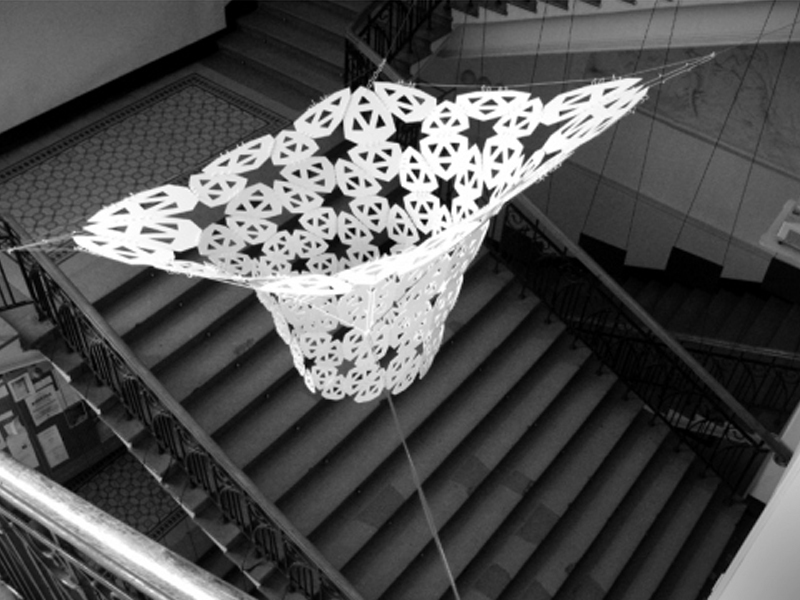 Description: Digital Timber is a workshop on virtual design inspired by origami, the fascinating art of folding paper. We focus on the production process of folded plates on a larger scale and its challenges. Description: SuperReal is about the manipulation of the mass information in the Big Data Era. Due to the development of multi-media technologies, everyone has submerged in the data ocean. Data could be generated by anything surround us. Instead of generating forms and effects, the key of SuperReal is, how we can parameterize the information mapping, regardless visible or invisible, with visual communication. Various multi-media tools will be used in data collection, processing and presentation. 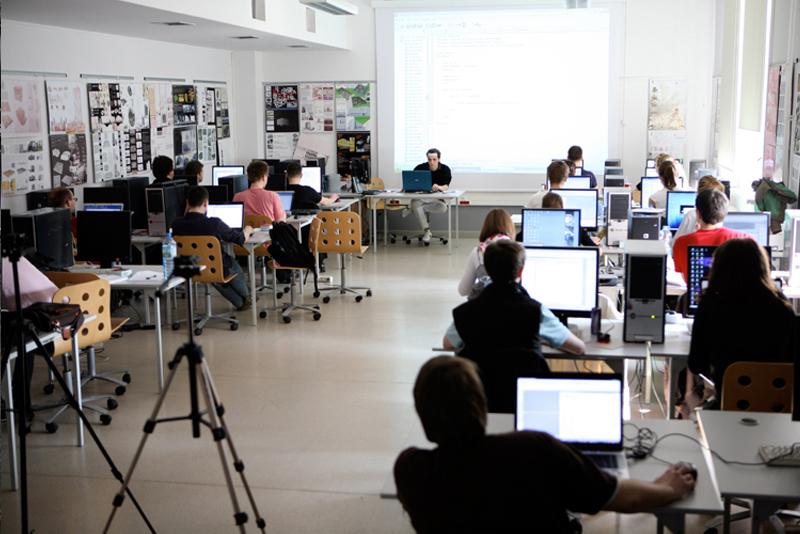 The workshop will start with exercises of data mapping and visualization through parametric modeling tools. Description: The workshop introduces recent developments and tendencies in the design of tall buildings to the DRX 2013 researchers. Through a series of lectures, Agata highlights the critical aspects in the design of tall buildings, focusing on their structural performance. The workshop is divided into two parts. The first familiarizes the participants with the existing structural systems commonly used in the design of tall buildings throughout history, for example, rigid frame structures, rigid frame + core, core+ outrigger, perimeter and hybrid structures. The second part focuses on the characteristics of height-active structures due to their extension in height and susceptibility to horizontal loading. An emphasis is placed on understanding these height-active structures as integrated systems in a complex stress condition, as well as their ability to collect the loads, redirect them to the ground and provide lateral stabilization. Redirecting horizontal loads to the ground, as one of the crucial features of high-rise structures, may even become the form defining element in the design of tall buildings. 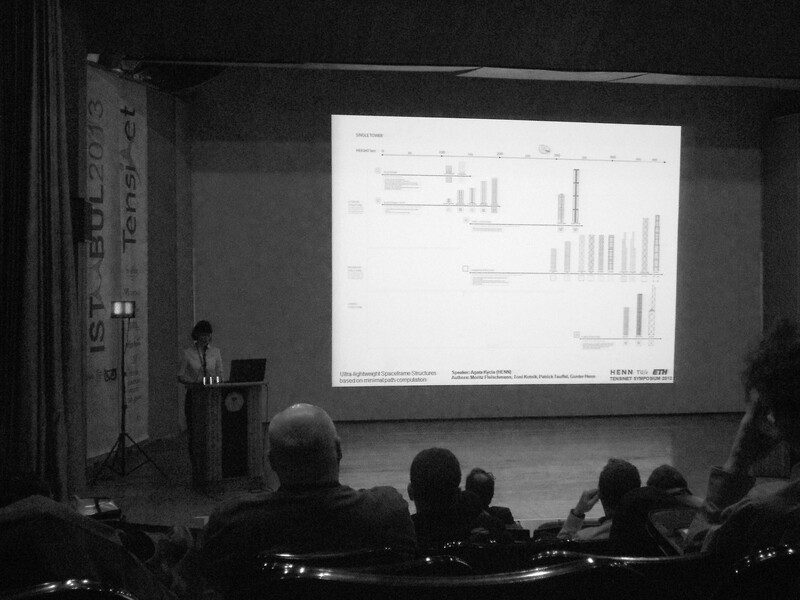 The workshop concludes with an explanation of the Prototower designed during the DRX 2012, published and presented during the Tensinet Symposium at the Mimar Sinan Fine-Art University in Istanbul. 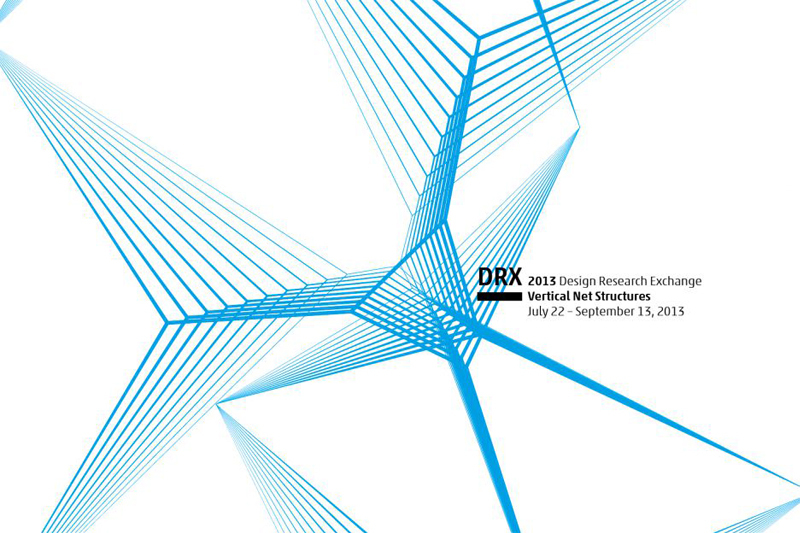 More information about the DRX 2013 you can find on the HENN website, or on facebook. 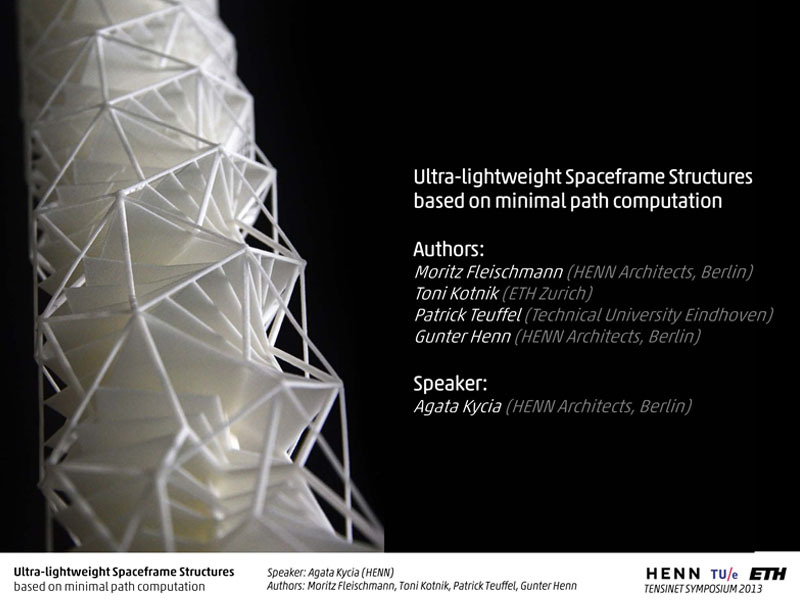 Description: The lecture refers to a 500m tall high-rise research project done during the DRX 2012 by Agata Kycia [HENN], Anna Wawrzinek (FU Berlin) and Danae Polyviou (TEUFFEL Engineering Consultants) at HENN in Berlin, focusing on exploring structural and architectural potential of minimal path networks. Description: Open source programming languages (such as Processing), in addition to the usual functionality for data processing, provide also a wide range of possibilities for visualizing data. During the course of the “Dynamic Diagramming” workshop, we taught basics of programing using Processing and implemented them into several examples. The task for the participants was to nterpret and represent graphically a chosen poem by writing a customized program. The only restriction was that the result should be printed by a machine-controlled pen on a sheet of paper (1000x700mm). More information about the seminar you can find here. 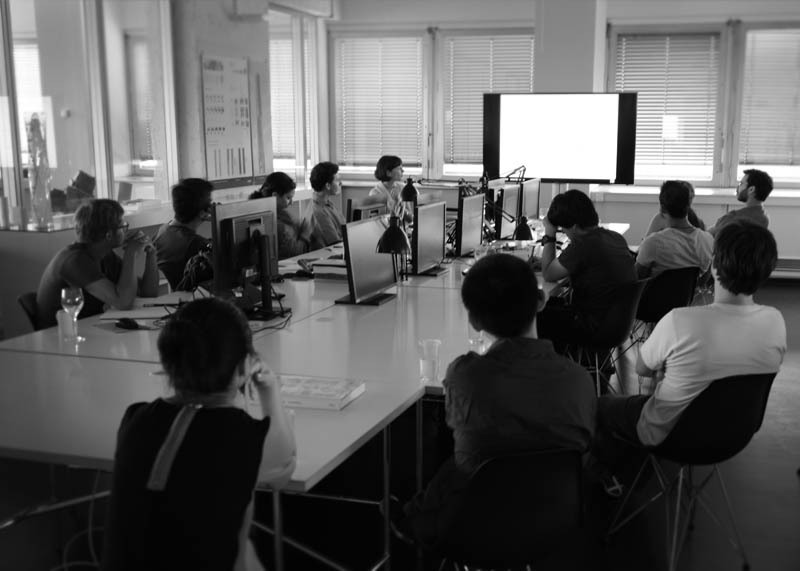 Description: The seminar taught by co-founders of WF aimed at introducing principles of parametric modelling (in this case Bentley’s Generative Components) and digital fabrication to the students of architecture. 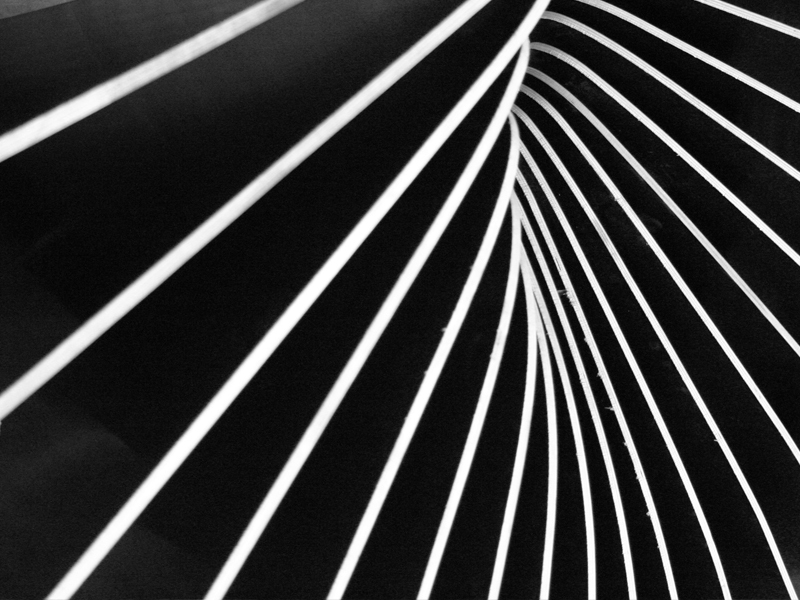 After a theoretical introduction, students were divided into several design groups, each of them making one a proposal for the temporary installation located in the main staircase of the faculty of architecture in Warsaw. One of the projects (by J.Bartos, M.Piotrowska, J. Soltyk, A. Zajkowski) was then chosen for fabrication in 1:1 scale using 2 axis CNC milling machine, and assembled at the faculty. The seminar was an elective course for the master students. The video below shows assebly process of the installation at the faculty of architecture in Warsaw. Description: This workshop was part of the Msc3 master program at the TU Delft; a technical training on Rhinoscript and Grasshoper. 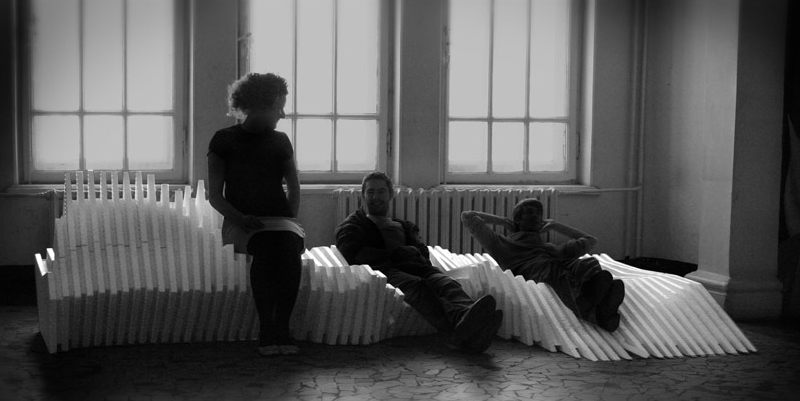 Six workshops organized by Workshops Factory in Poland and USA were exhibited during the Spontanous Schooling exhibition in June 2010, curated by Nous gallery as a part of London Festival of Architecture 2010. Thanks to the Faculty of Architecture at the Warsaw University of Technology, 3D printed models from the WF_091 workshop were also part of the exhibit. Description: This workshop was a technical training on Bentley’s Generative components and an introduction to digital fabrication. 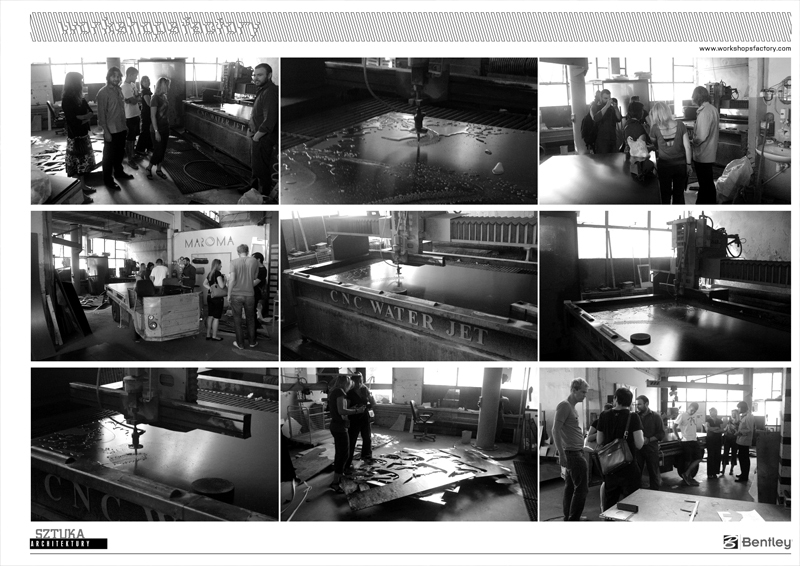 We fabricated one of the proposals in 1:1 scale using 2D water jet and assembled it on spot. More information you can find here. Description: WF_091 was a workshop on generative design methodologies and computer aided manufacturing, organized by Workshops Factory in collaboration with Warsaw University of Technology, School of Architecture (WAPW). The aim of this workshop was to explore potentials of a fully integrated design process which incorporates digital techniques from a very early stage; starting with the use of programming as a design strategy and leading to digital fabrication as the construction technique. Participants had to design generative algorithms to personalize urban furniture and then manufacture instances of those procedures at 1:1 scale. 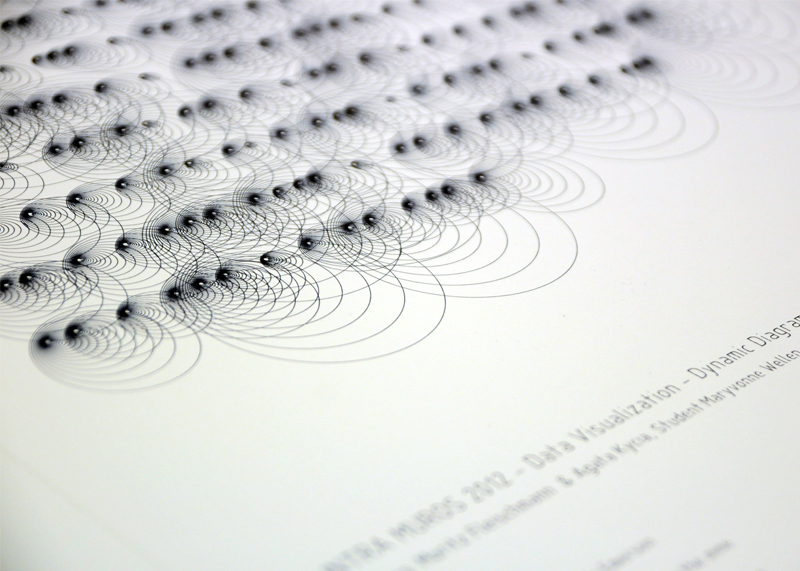 The workshop began with a set of presentations on the potential of generative methodologies in design, design as a controlled flow of information and computer aided manufacturing. Later, students where introduced to the syntax of Visual Basic. In the next stage participants were working in small groups on customized modules of a bench. 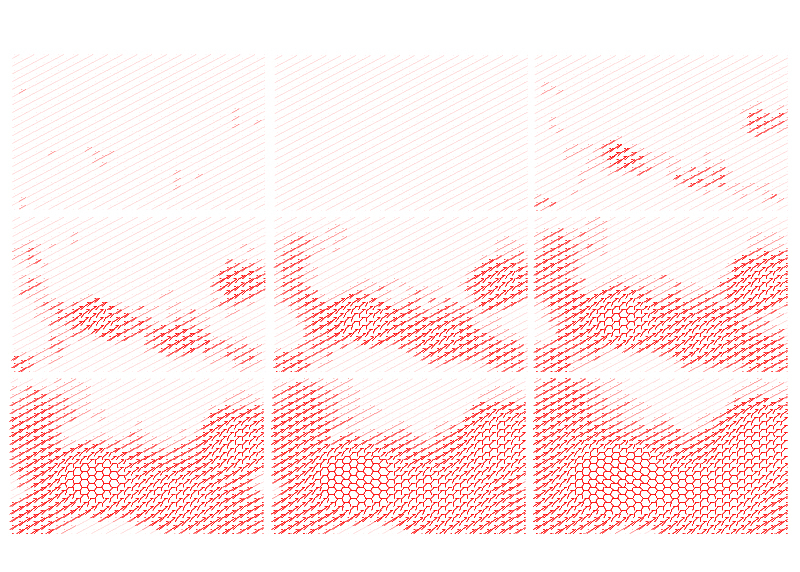 At the end we fabricated and assembled three 1:1 scale modules of different seats using a thermal plotter.